In the wake of several near-cataclysmic events, humanity created the Cure, a DNA-altering antidote to death by disease and old age. But all cures come with side effects: a small percentage of the population develops a wide range of powers, some of which are lethal to others, and some which are lethal to the wielder. These people are called the Estranged, hunted and shunned, safe only on the Island of Exile. It is here that Kaeva and Eddie meet-and where they set a prophecy in motion, quite possibly sealing their own demise, and even the end of Exile. I requested Breaker on a whim after reading a review by one of my Goodreads friends. I've never read anything else by either author before, but I do like sci-fi/dystopian stories, so I figured I would give these new-to-me authors a try -- and it worked out beautifully. Breaker is my kind of story. Breaker takes place in a future where, in an attempt to combat deadly viruses that have been unleashed, humans find the cure to everything. Sound dangerous? For most people it seems to work out, it stops the aging process, cells renew quickly, people don't get ill anymore and they heal amazingly well. It doesn't make people immortal, though, but no one is certain what the new life span is. There is some portion of the population, however, for whom things don't go so smoothly, however. The Cure makes them sick; it overwhelms their immune systems. Many of them die, but those that survive being cure sick get a little something extra. Something like healing or sucking the life out anyone you touch. It's different for different people. But even the good extras come with side effects, so it's not not all 'hey look guys, I've got a super power!'. Not at all. The people with the 'extras' are called the Estranged and they are revered, but feared. Eddie comes from what used to be a wealthy family. They still have some money, but his mom goes through it pretty quickly. Compared to a lot of people, though, he has had it really well. He was able to get an education, he has nice clothes and food to eat. But Eddie grows tired of living. He is the Estranged, and his ability allows him to hear the dark thoughts of others. The thoughts where they are planning or wishing to do violent things. He can hide his ability pretty well, but he can't turn it off, so he bides his time until he can go away somewhere and just end it. His travel plans get interrupted and instead to going to his uncle's island, that he just inherited, he ends up heading for Exile, instead. Exile is an island everything thinks is a myth. It's not a myth at all, but rather a very well protected island sanctuary for Estranged that find out about it and make it to the island. And that journey is not easy. Kaeva has lived on Exile for eight years. He's a very solitary man because he is a danger to people and electronics, especially, but not limited to, when his emotions are erratic. He can't touch anyone without killing them, unless he takes suppressors, which suppresses his 'extra' ability, but they are very unpleasant to take. Kaeva is as happy as he's ever been, because he is at peace with his loneliness. Eddie and Kaeva are brought together via a prophecy, but so much is still uncertain when they meet. Kaeva does not like being put in a position of being responsible for another, especially when Kaeva, himself, poses the biggest danger, and Eddie is still planning on dying. I really enjoyed watching their relationship progress from reluctant to somewhat friends to lovers. I loved how it all unfolded and we learn so much about the world and the Estranged and they even learn things about themselves and each other that they didn't know before. I found Breaker to be a unique take on the 'mutant' genre and I was quickly drawn into the story and the world and I look forward to reading more. 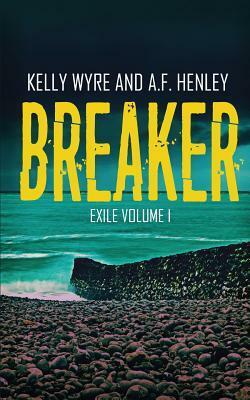 Review copy of Breaker was generously provided by the publisher, via NetGalley, in exchange for an honest review.